During September, I kept getting the feeling that I wasn’t eating enough fruit and vegetables. In October, I started throwing around a few things, such as the beet chips, pie, and so on. For the past month or so, I have been on an insane morning smoothie kick. And it is generally the same smoothie every day with a few substitutions. I use the recipe from The Green Fork as my base, but experiment a bit with it, depending on what I have in the house. Added a bit of arugula or kale, when I didn’t have enough spinach, or add frozen spinach instead of fresh. I might replace the apple with a carrot, replace the banana with half an avocado, if I want to bring down the sugar content a bit. Or bring up the vegetable content. I tried adding a beet once, but peed pink the next day. Beets, spinach and strawberries in a smoothie makes for an iron overload for me, so I try to avoid that. I try to use the same ratios that are in the original. What I do, that the original recipe doesn’t: I add a bit of fresh ginger for a bit of extra heat. I figure the ginger is good for digestive issues and had immune boosting effect… it also adds extra goodness there. If I don’t manage to have it for breakfast, such as the day I overslept, I turn it around, and have it as a light dinner. 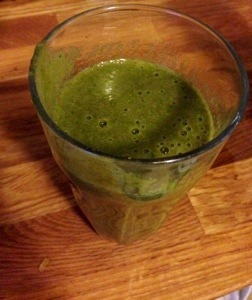 I actually came home from work nauseated and worn down one day (there’s been an insane amount of candy going on, and I have no will-power,) and had a variant of this smoothie (lemon juice, water, kale, avocado, apple, ginger, cucumber and strawberries) and the nausea not only disappeared, but I felt amazingly rejuvenated. The recipe makes an insane amount of smoothie, but it will keep me well fed well until lunch and I haven’t had any other cravings (other than the candy at work) so… score? Previous What’s Your Movie Monster Name?